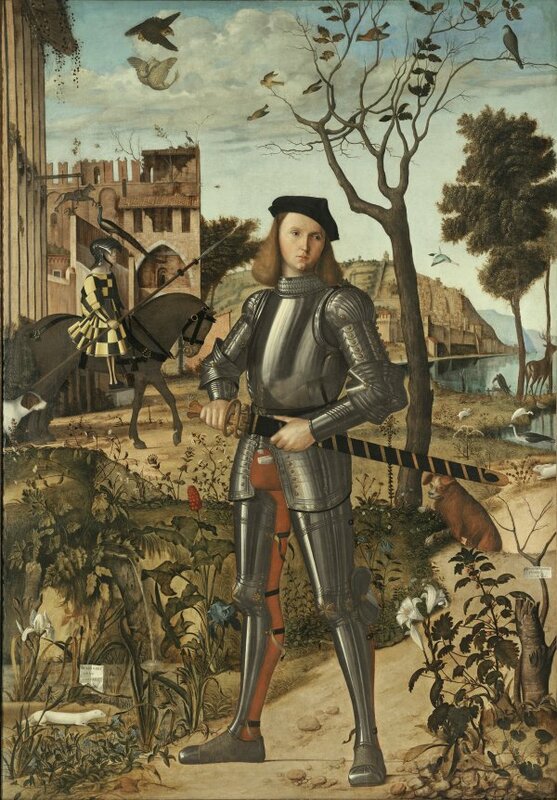 Young Knight in a Landscape is one of the most famous and celebrated works in the Thyssen-Bornemisza collection. The canvas is signed and dated on the cartellino attached to a low tree trunk on the right: “VICTOR CARPATHIUS / FINXIT / M.D.X.”. On the opposite side is another inscription among the plants and foliage: “MALO MORI / QUAM / FOEDARI”. The canvas was in the Vernon-Wentworth collection in Yorkshire until 1919 and for part of the 20th century was attributed to Dürer due to the fake monogram (now removed) and the fact that the two inscriptions were concealed by later over-painting prior to the painting’s restoration in 1958. The fake monogram was removed while the painting was in the possession of the London dealers Sully. This old attribution to Dürer can undoubtedly be explained by the minute detail in which the flowers and vegetation are painted. In his Lives, Vasari devotes few lines to “Vittore Scarpaccia”, whom he included in a chapter together with other northern Italian painters.Vasari only refers to two works by the artist: the Saint Ursula cycle painted for the Scuola of that saint and now in the Accademia in Venice, and a panel of Saint Ambrose for the Minorite Friars, incorrectly attributed by Vasari to Carpaccio, an artist whom he considered that without being “one of the great and high geniuses, [he] was a skilled and expert painter”. With regard to the identity of the figure depicted here, the first suggestion was that of Saint Eustace, the title of the painting when it was included in a Christie’s auction of November 1919, in which the painting was correctly attributed to Carpaccio despite the fact that the inscriptions were not visible at that date. The idea of Saint Eustace, a popular saint in France and Germany, was based on the presence of the deer next to the lake, suggesting one of the saint’s traditional attributes: a deer with a crucifix in its antlers. The painting was subsequently in the collection of the American Otto H. Kahn and was acquired in 1935 by Baron Heinrich Thyssen- Bornemisza. In 1958, given the poor physical condition of the canvas, it was restored, at which point the two inscriptions with the signature, date and Latin phrase were discovered. Photographs of the canvas before and after restoration were published by Lauts in his monograph on Carpaccio of 1962. All attempts to identify the young knight have so far proved unsuccessful. Helen Comstock suggested that he was a member of the Order of the Ermine. The motto Malo mori quam foedari (better to die than be defiled) was the motto of that order, while next to the cartellino with the motto Carpaccio painted one of these animals. In 1938 Agathe Rona returned to this idea, suggesting that the knight was Ferdinand II of Aragon and that the Order of the Ermine was associated with the Neapolitan branch of the house of Aragon. In the catalogue of an exhibition on Carpaccio held in Venice in 1963 Weiss, however, identified the sitter as Francesco Maria della Rovere, third Duke of Urbino. This idea, which is the one most generally accepted, was subsequently developed by Rosenbaum who established links between the sitter and the landscape through a symbolic reading of various elements within it. Despite all the above, the identification of the sitter is still not totally clear. Other authors have identified the young man differently: as a Habsburg prince, as Antonio da Montefeltro (which would be a posthumous portrait), as a German soldier in the service of Venice, or as Rolando de Ragusa.Venturi read the painting in terms of a chivalrous fantasy. If it is in fact a portrait, it would be the first known example in which the sitter is depicted full-length. It has been suggested that this new format can be explained if this image were a posthumous portrait of a soldier, in which case the figure would be similar to funerary images of a comparable type and date. The landscape around this enigmatic young man is as mysterious and troubling as he is, combining as it does flowers and animals that refer both to good and evil, purity and corruption.